I believe my first proper experience with Colemak was on the 28/01/2018. I had just finished a two hour session on this typing trainer and my brain was aching. I went to work thinking in the back of my head what I had just done, it must've been so mentally exhausting that I wasn't thinking straight. I had just been overwriting circuits in my brain that have been there for years! No wonder! The day after I begin practising the layout more. 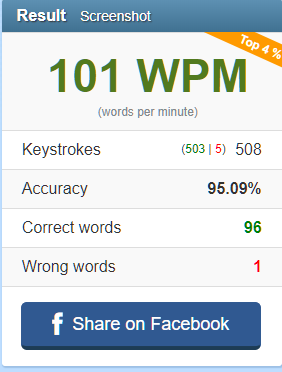 I begin to average 10-13 WPM on 10FastFingers, my head still completely exhausted with each keypress. Compare that to my 70-80 average on QWERTY! I spend ages doing continuous typing tests just to get as much practise in as I can. The reason I stick around is that the process of learning something this new makes me feel great, and I notice that every time I go to bed, I wake up with a 7-8 WPM increase. Even at 10 WPM I knew my fingers were moving around a lot less than QWERTY, and I was beginning to pick up on these lovely finger rolls I kept doing. What really helped was Klavaro, a touch typing tutor that taught me how to touch type with the new layout. Vital! It was awkward at first, but if my fingers were moving around less before, they really weren't moving at all now. I began to notice my QWERTY muscle memory disappear, going down to 40 WPM at one point (effectively halved) which was shocking, but all the while I was getting more confident with Colemak. Halfway through this process, I began posting on these forums, at first calling for help to create a standalone Wikipedia article and then to make a new Discord server. By this point I knew that Colemak was the way I wanted to go for the long term. As righteous as it sounds, I want to make sure as many members of the public know about the layout as possible - the more adoption, the greater chance I will be taken seriously in say, a place of work where I'd want to change my layout on a locked down system. The more people who know, the greater chance Colemak will be included by default in Windows! The more people who know, the greater chance I'll be able to buy some high quality custom mechanical keyboard caps for the layout (I've been searching!). Obviously we'll never surpass QWERTY usage, but we could definitely surpass Dvorak usage, perhaps even by a lot. Public awareness is a great thing for Colemak users. My current typing speed on Colemak is 55-60 WPM by typeracer, and 65 WPM by 10FastFingers. What is more impressive is that all of my QWERTY muscle memory has come back in nearly full strength. I can swap between the two by using my awful old QWERTY typing method I came up with over years, and switch to real touch typing when I want to use Colemak. Even on a locked down system it looks like I'd be fine! In 20 days I went from completely no knowledge to 55-60 WPM - so I'm really optimistic about the future with the layout. I'd highly recommend Colemak to pretty much anyone who has time to invest, especially to those fast QWERTY typists who don't use proper technique. I switched cold turkey, so I have no real knowledge of the Tarmak layouts, it's just what worked for me. It's painful at first, but it's well worth it. I hope Colemak continues to spread like the plague be adopted - it's made typing so much nicer for me and other typists. Plug for the Discord server! If you're new to the layout like I recently was, you might find it useful to talk with other users about their experiences, as well as in general keyboard related things. On the side, I noticed this by Shai on the main page. If he's reading this, and the plan to move away from MediaWiki isn't happening, I'd be happy to maintain the wiki if needed. At the very least, adopting the Vector skin for the website (the default for Wikipedia) might make things look more modern. In 20 days I went from completely no knowledge to 55-60 WPM - so I'm really optimistic about the future with the layout. I'd highly recommend Colemak to pretty much anyone who has time to invest, especially to those fast QWERTY typists who don't use proper technique. That's fast progress, but actually, even if it takes a couple of months, like it did for me, it's still well worth it. I find that people tend to instinctively get the inefficiency of Qwerty. But the reason they don't switch, is because they see the relearning barrier as too onerous, and not worth the effort. But this doesn't really stand up if you analyse it. You might easily spend decades of your professional life working at a keyboard. So a few weeks training would certainly seem the effort if at the end of it, your everyday work becomes easier and more comfortable. People think it's normal and worthwhile to do other kinds vocational or professional training - often taking several years to attain mastery in their fields. But even though they might use a keyboard for hours every day, the same thought never crosses their minds. In the mainstream, typing is a forgotten and undervalued skill that the modern world relies on, but almost nobody values. It's a funny old world. It's interesting how many seem to believe that typing will be a thing of the past any time now. True, voice recognition is decent these days but I wouldn't want my office to be based on that unless subvocalizing becomes really efficient and/or we get noise-cancelling equipment! I wonder if voice will only be for niche purposes - mainly at-home and leisure. For work purposes I think it keyboards will be around a lot longer. Ironically, I suspect it's the dominance of Qwerty that is putting pressure on existing keyboard technology. People don't really like using keyboards. But if well-designed physical keyboards and layouts were standard, there would be more support for keeping them. Voice recognition is a great thing and I use it for messaging via Apple Watch all the time. Great, until it goes smooth. In case of mistake, the only option in Apple Watch is to cancel the message and start over. It also understand only proper language, a slang may be recognized, may be not, you never know. Mix of languages almost never work, while sometimes some English words may be recognized. Haha, that's also the reason why native English speakers don't like to speak French!! Yeah, I have the problem, albeit to a lesser degree speaking English and German, my voice is quite a bit deeper in my mother tongue, I don't really know why, but I'd really like to get the same voice in at least German, as that's what I speak on a day to day basis. if to threaten someone or to speak harshly to them, in German, for their entire language is threatening, rough and vehement. Regarding Russian, I heard from Americans that it sounds as I'm quarreling every time when I'm speaking Russian over the phone. Not at all. Normal Russian speaking is quite monotonous and lack of intonations compare to English. Normal English speaking sounds like playing the ape for Russian ear, until you get used to it. I told a Portuguese fellow that I love singing in their language. It's so melodic. He replied that he really loved Norwegian, as it sounds like "angels singing"! Wow. It's true that Norwegian has a certain melody to it. We natives usually don't notice that until a foreigner makes us aware of it. Some languages have a particularly noticeable "sing-song" sound, due to different tones being used in the language itself. Cantonese being a good example. So it's been roughly two more months since I wrote this post. I get a standard 85ish WPM on 10FF (been doing so for at least a month and a half) - with a peak of 99 WPM (just one off 100!!). My experiment was a success in trying Colemak out. I often think 'Okay, so you've done this now, why not go back to QWERTY?' So I try out QWERTY typing and I get a solid 60 WPM. Perhaps not through QWERTY's fault but rather my own, I type with the incorrect touch typing technique and it feels like my hands go all over the place once again. Then I go back to Colemak and remember why I switched in the first place. Unless I go to work in an environment where I've exhausted all my options for trying to type on Colemak, going back seems highly unlikely. Typing on Colemak is just the better option, why use something that's worse? See these reference videos I made a bit ago to see where I'm personally coming from. I start out on QWERTY and then switch to Colemak halfway through on each one. You'll be able so see which one I'm using based on how loud my keyboard is, and how my hands have to move around. That's all I have to say! To any newbies reading this post, take the plunge! Before you know it, you'll like it. And as always, plug for the Discord Server! I don't know that I could ever fully replace typing, especially now. It's way too much fun and the options when making one's own equipment are ever growing and changing. Why turn away from a technology when it's such a cherished part of computing? I would also not want that replaced, typing is just such a precise way to get things across, it maps directly to what we're trying to get across, and doesn't have to go through dozens of interpretations and corner cases before getting through. Update: I've been using Colemak-DH for the past month or so now and I quite like it. I'll be the first to say I think people should start with vanilla Colemak and then see if DH is for them - the angle mod is good and all but took ages for me to personally get used to. With that said, the small improvements over vanilla here and there are lovely. I'm at my old Colemak speed of 80-90 quite comfortably, and it's even more buttery smooth. In all seriousness, having used Colemak for 3 and a half months, I actually got to the point where I was thinking 'that's enough of this experiment, time to go back to QWERTY'. So I did for a day or two, and my accuracy and speed was pretty good like I used to be on QWERTY. It was like I never had learned another layout. But once you know how little your fingers actually have to move on the right layout, it's very hard to want to willingly type on the worse layout. So I really confirmed to myself that it's probably Colemak for life, as you just can't stop noticing how crap typing on QWERTY is after you properly learn it. It's like taking the red pill. You're probably scarred with it for life after you learn it. You have been warned! To anyone considering Colemak for the first time, be careful about taking the red pill. You might be able to, but really won't want to type on QWERTY once you've learnt it. Nonsense! That was very productive! 137 days after first starting on my Colemak journey, I finally hit 100 WPM for the first time! It took a ludicrous amount of practise to get here (i mean ludicrous), but I got there in the end. Stick to your silly no-life goals and you'll eventually reach it is the moral of the lesson! Are you able to consistently achieve that speed?